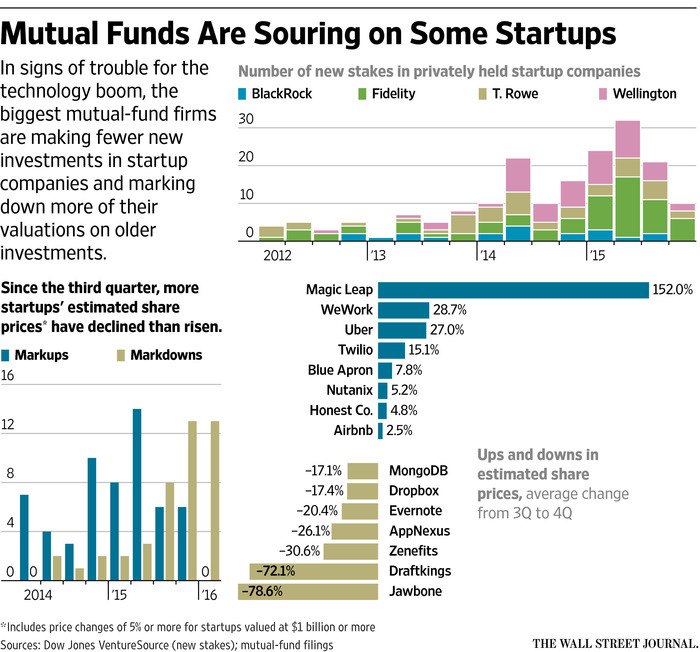 Startups Back on the Menu? In theory, the recent rebound in equity markets—especially in technology-related shares, which were major laggards as the year unfolded—should be great news for young companies. As discussed previously (see here and here), valuations, activity and interest in private market growth businesses and initial public offerings have been subdued, to say the least. But with investors seemingly upbeat again, it is only natural to think that finance-hungry startups should be seeing a corresponding improvement in their fortunes. Unfortunately, that does not seem to be the case. While there are signs of hope, they are few and far between. Specifically, the business news channel noted that “there have been no IPOs on the New York Stock Exchange since December 18, when financial technology company Yirendai went public, marking the second-longest drought in the exchange’s history, according to Dealogic, a New York-based financial services firm.” The last time such a drought occurred, CNBC added, was during the financial crisis. Not helping matters has been the ongoing fallout from LinkedIn’s disastrous fourth quarter earnings report, released in early February. The shares of the former high-flyer, which came to the market in 2011, crashed 44% after the company announced disappointing fourth quarter results and weaker-than-expected full-year guidance. Although LinkedIn has had a modest bounce since then, the effects of its negative surprise are still being felt, particularly among younger and smaller technology firms. Each week brings fresh bad news for Silicon Valley’s would-be “unicorns.” There are layoffs at LivingSocial, warnings about LinkedIn, and pivots at valet-parking startups. The “Uber for X” model rarely works except when X = Uber. Valuations are shrinking, funding is falling, and there’s ill-concealed glee at the signs that yet another tech bubble is, if not exactly bursting, at least looking distinctly deflated. But it is not just estimates that are moving lower. News regarding the latest financing rounds for some well known unicorns suggest that investors are becoming more demanding with respect to pricing and other terms. BuzzFeed News recently reported that cloud storage startup Dropbox was facing questions about its valuation because of plans “to authorize a sale of its common stock at a 34% discount to its most recent round of private funding,” which took place in January 2014. The firm, Renaissance Capital, notes that its IPO Index, which tracks the performance of the last two years’ worth of IPOs, has significantly underperformed the broader market from last August through the first half of February. However, the firm believes the recent jump in the index, up about 14% since then, indicates “‘that investors are looking at the existing set of IPOs and coming in with more confidence buying them”–in other words, the “window of issuance” will soon reopen. That said, it is hard not to doubt that the situation will improve anytime soon. For one thing, the recent recovery in equity markets appears to have largely been driven by short-covering and technical factors rather than fundamentals, suggesting it lacks staying power. There is also the fact that interest in startups has, historically speaking, been somewhat cyclical, and that the reversal of fortunes that began last year potentially marked a major peak. Time will tell, of course, but for now, caution remains the watchword.